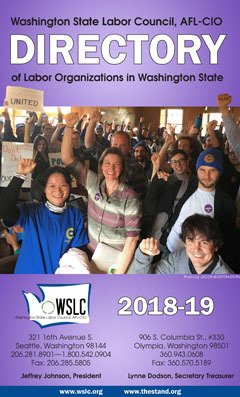 Here is the latest edition of the Washington State Labor Council’s Directory of Organizations. Following are links to the websites of local unions affiliated with the Washington State Labor Council, AFL-CIO (and their international unions) and a summary of the types of workers they represent. If your affiliated union is not listed, please send us your web address. Most of today’s unions represent a wide variety of occupations and trades, some of which may not be listed here. Actors, and Television & Radio Artists (SAG-AFTRA) — Approximately 160,000 actors, announcers, broadcast journalists, dancers, DJs, news writers, news editors, program hosts, puppeteers, recording artists, singers, stunt performers, voiceover artists and other media professionals. SAG-AFTRA members are the faces and voices that entertain and inform America and the world. Bakery, Confectionery, Tobacco Workers, and Grain Millers International Union is a modern union with old-fashioned values, dedicated to giving workers in its industries a voice and a vote in their workplace. Boilermakers, Iron Ship Builders, Blacksmiths, Forgers and Helpers, International Brotherhood of — Metal fabricators and welders who build and repair ships, cranes, offshore-drilling platforms, boilers, tanks, pressure vessels, plate and structural fabrications. Bricklayers and Allied Workers, International Union of — Workers/masons who cut, bond and install stone and brick for a wide variety of structures. Communications Workers of America — Employees in the following industries: telecommunications, journalism, airlines, printing & publishing, broadcast media, customer service & marketing, and cable television. CWA District 7 represents Washington, Alaska, Arizona, Colorado, Iowa, Idaho, Minnesota, Montana, North Dakota, Nebraska, New Mexico, Oregon, South Dakota, Utah, and Wyoming. The Newspaper Guild is a CWA affiliate. Washington Alliance of Technology Workers/CWA 37083 — High-tech workers and allies joining together to provide an effective voice in the legislative and corporate arenas, and to advocate for improved benefits and workplace rights. Electrical Workers, International Brotherhood of — Electricians working in all phases of construction and service, commercial and residential. Engineers, International Association of Professional and Technical — A wide range of occupations including engineers, drafters/designers, computer operators/programmers, inspectors, legal workers, planners, nurses, public relations officers, scientists and many others in both the public and private sectors. United Farm Workers of America — Begun in 1962 by Cesar Chavez, Dolores Huerta, Gilbert Padilla and other early organizers, the United Farm Workers of America is the nation’s first enduring and largest farm workers union. Familias Unidas por la Justicia — FUJ is an independent farmworker union of indigenous families located in Burlington, Wash., representing more than 500 Triqui, Mixteco, and Spanish speaking workers at Sakuma Bros. Berry Farm. Fire Fighters, International Association of — Full-time, paid employees engaged in fire fighting, emergency medical or rescue service activities. Local area unions are affiliated with the Washington State Council of Fire Fighters. IAFF Local 1488, West Pierce Co. Flight Attendants, Association of — The Association of Flight Attendants-CWA (AFA-CWA) is the world’s largest labor union organized by flight attendants for flight attendants. AFA represents over 55,000 flight attendants at 20 airlines, serving as a voice for flight attendants at their workplace, in the industry, in the media and on Capitol Hill. Food and Commercial Workers, United — UFCW represents workers in a range of industries, including health care, retail food, meatpacking, poultry and food processing, manufacturing, distillery, winery, textile and chemical trades. Glass, Molders, Pottery and Plastics and Allied Workers International Union — Workers in a broad scope of industries, including fine china, glass and plastic containers, insulation, sanitary ware and other related products and services. Government Employees, American Federation of — Federal government employees. Heat and Frost Insulators and Asbestos Workers, International Association of — Workers who apply insulation materials to pipes, tanks, boilers, ducts, refrigeration equipment and other surfaces requiring thermal control, or who do removal of asbestos-containing material. Iron Workers, International Association of Bridge, Structural and Ornamental — Workers who assemble and erect steel framework and other metal parts in buildings, on bridges, dams and other steel structures. Laborers International Union of North America — Highway, utility and building construction workers doing clearing, grade checking, stake hopping, culvert installation, equipment signaling, traffic control, excavation, shoring and pipe laying. Environmental laborers do asbestos removal, hazardous waste and radiation cleanup. Letter Carriers, National Association of — City delivery letter carriers working for the U.S. Postal Service. The statewide organization is the Washington State Association of Letter Carriers. Machinists and Aerospace Workers, International Association of — Workers from more than 200 wide-ranging industries. In the Pacific Northwest, the biggest IAM unions principally represent airplane manufacturing workers (Boeing’s belong to IAM District Lodge 751) and workers in the forest products industries. Marine Engineers‘ Beneficial Association (MEBA) — Marine engine and deck officers, and crew of the most technologically advanced ships in the U.S.-flag fleet, including cruise ships, tankers, vessels on the Great Lakes, and container ships. Members also sail aboard government-contracted ships of the U.S. Navy’s Military Sealift Command and the Maritime Administration’s Ready Reserve Force, on tugs and ferry fleets around the country, as well as fireboats, and in various capacities in the shoreside industries. PASS (Professional Aviation Safety Specialists) — PASS members ensure the integrity, reliability, and safety of the commercial and general aviation industries. They include Technical Operations and Department of Defense employees who install, maintain, repair and certify the radar, navigation, communication and environmental systems making up the air traffic control system; Flight Standards and manufacturing aviation safety inspectors; flight inspection pilots, missions specialists and procedures development specialists; and administrative employees in the FAA’s Aviation Registry. Musicians, American Federation of — The largest organization in the world representing the interests of professional musicians. Whether negotiating fair agreements, protecting ownership of recorded music, securing benefits such as health care and pension, or lobbying our legislators, the AFM is committed to raising industry standards and placing the professional musician in the foreground of the cultural landscape. Nurses Association, American — The American Nurses Association represents the interests of the nation’s 4 million registered nurses (RNs) through its constituent and state nurses associations and its specialty nursing and affiliate organizations that currently connect to ANA as affiliates. Office and Professional Employees International Union — OPEIU represents employees in social services, housing, hospitals and medical clinics, credit unions, offices, higher education, transportation, shipping, public sector, webmasters and other workplace settings. Operating Engineers, International Union of — Heavy equipment operators, mechanics, and surveyors in the construction industry, and stationary engineers, who work in operations and maintenance in building and industrial complexes. The IUOE also represents nurses and other health industry workers and public employees. Painters and Allied Trades, International Union of — Painters, paint makers, drywall finishers, tapers, paperhangers, decorators, linoleum, carpet and soft tile layers, sign painters, glaziers, scenic artists, metal polishers, public employees and many other allied trades. Plasterers and Cement Masons, International Association of Operative — Workers who finish the interior walls and ceilings of buildings, apply plaster and/or cement on masonry, metal, wire lathe or gypsum, and pour/finish/repair concrete slabs, steps, walls, gutters, sidewalks and other paving. Plumbing and Pipe Fitting Industry, United Association of Journeymen and Apprentices of the — Multi-craft workers engaged in the fabrication, installation and servicing of piping systems. Postal Workers Union, American — Employees of the U.S. Postal Service who are clerks, maintenance employees, motor vehicle operators, and non-mail processing professional employees. Pulp and Paper Workers, Association of Western — Represents more than 4,000 workers at pulp and paper mills in Oregon, Washington, Idaho, California and Virginia. Formerly independent, it’s now an autonomous division of the United Brotherhood of Carpenters. Roofers, Waterproofers and Allied Workers, United Union of — Workers engaged in all aspects of roofing and waterproofing buildings and shelters. Seafarers International Union — Unlicensed U.S. merchant mariners (in the deck, engine and steward departments) sailing aboard U.S.-flag vessels in the deep sea, Great Lakes and inland trades. The union also represents licensed U.S. mariners in the Great Lakes and inland sectors. Sheet Metal Workers‘ International Association — Craftpersons working with decking/siding, dust collectors, energy systems, HVAC, kitchen equipment, paint booths, railroad cars, service tech, ships, signs, skylights, stainless steel plus thousands of other sheet metal products. State, County and Municipal Employees, American Federation of — Public service and health care workers employed by the state, county or city governments. In Washington, AFSCME members are represented by two councils, the Washington State Council of County and City Employees, AFSCME Council 2 and the Washington Federation of State Employees, AFSCME Council 28. In addition, there is a Retired Public Employees Council of Washington. Steelworkers, United (USW) — Workers in steel, aluminum, can, mining, manufacturing, pharmaceuticals, energy and utilities, paper and forestry products, health care, chemical and other industries, but also workers in retail, service and public sectors. Also, workers who make paper and refine oil, chemicals, nuclear materials, pharmaceuticals, automobile and truck parts, appliances and many other products. The USW merged with PACE (the Paper, Allied-Industrial, Chemical and Energy Workers) in 2005 to form the largest industrial union in North America. PACE was formed 1999 by the merger of the United Paperworkers International Union with the Oil, Chemical and Atomic Workers International Union. Teachers, American Federation of — In Washington state, the locals comprising the AFT Washington represent community and technical college faculty and classified staff. Transit Union, Amalgamated — Bus, van, subway, and light rail operators, clerks, baggage handlers and maintenance employees in urban transit, over-the-road and school bus industries, as well as paramedical personnel, ambulance operators, clerical personnel, and municipal workers. Transportation — The United Transportation Union is a broad-based labor union representing about 125,000 active and retired railroad, bus and mass transit workers in the United States and Canada. UAW — The International Union, United Automobile, Aerospace and Agricultural Implement Workers of America (UAW) is one of the largest and most diverse unions in North America, with members in virtually every sector of the economy. UAW-represented workplaces range from multinational corporations, small manufacturers and state and local governments to colleges and universities, hospitals and non-profit organizations. The UAW has about 640,000 active members and over 500,000 retired members in the United States, Canada and Puerto Rico. UAW Local 4121, Seattle — Representing approximately 4,000 Academic Student Employees at the University of Washington. UNITE HERE — UNITE (formerly the Union of Needletrades, Industrial and Textile Employees) and HERE (Hotel Employees and Restaurant Employees International Union) merged in 2004 to form this union representing workers in the apparel/textile, hotel, casino, food service, airport concessions and restaurant industries. Writers Union, National (UAW Local 1981) — The only labor union that represents freelance writers working in all genres, formats, and mediums. Through its parent union, The United Auto Workers, the National Writers Union is a member of the AFL-CIO. The NWU works to advance the economic status and working conditions of writers.